The Mount Hope Coalition to Increase Food Security aims to educate residents of Providence, Rhode Island, on the health and economic benefits of producing locally grown food and options for securing fresh, healthy food. Of the 152,000 food insecure individuals within Rhode Island, nearly 100,000 live in Providence County. Within the City of Providence, Mount Hope is a diverse neighborhood that faces many challenges. Grocery stores are available throughout Providence, but prices are high and healthy food is inaccessible for those with limited income. Nearly 44 percent of Mount Hope residents live below the 200 percent Federal Poverty Line and 23 percent live below the 100 percent Federal Poverty Line. "Our increasing food security work is dependent on our building community capacity to address the challenge. This starts with developing community health worker food access advocates for the Mount Hope neighborhood. Our recent food system workshop helped to raise awareness around the extent and gravity of the issue of food insecurity, in general, and in our community specifically and the need to act now." Food insecure people are especially vulnerable to obesity. Data show that between 62 percent and 72 percent of residents were classified as either obese or overweight. During the Plan4Health project period, the Mount Hope Coalition to Increase Food Security worked to build comunity capacity by expanding coalition membership and increasing access to healthy food. The coalition identified existing resources and evaluated the feasibility of establishing additional gardens, greenhouses or urban farms — and decided to create an 11-bed Sharing Garden in Billy Taylor Park and a four-bed Teaching Garden at the Vincent Brown Rec Center. 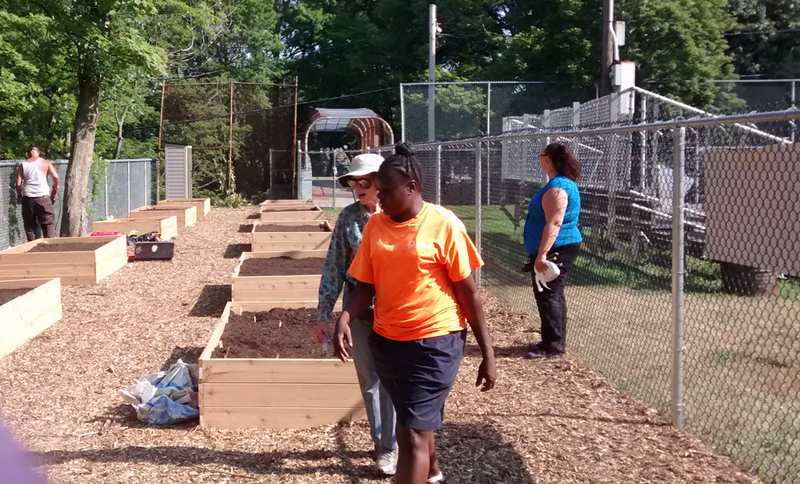 Community members build the 11-bed sharing garden in Billy Taylor Park in Providence, Rhode Island. Photo courtesy Mount Hope Coalition to Increase Food Security. Through the expansion and development of new food sources, the coalition allowed community members to get involved in the hands-on experience of gardening. However, the coalition does more than create space to assess food access or to build alternatives. The coalition also works to grow community connection and to foster resilience. An immediate impact of the Plan4Health project has been new collaborations with organizations outside of the Mount Hope neighborhood. One example is the partnership with The Steel Yard, a public arts and job training program that shares the coalition's commitment to community participatory principles. The coalition collaborated to engage youth at the Vincent Brown Rec Center to design and finish a fence that not only protects the Rec Center garden, but also brings beauty and color to their play yard. The fence is a work of art--and the workers who cut and welded the fence were trainees in The Steel Yard’s job training program. 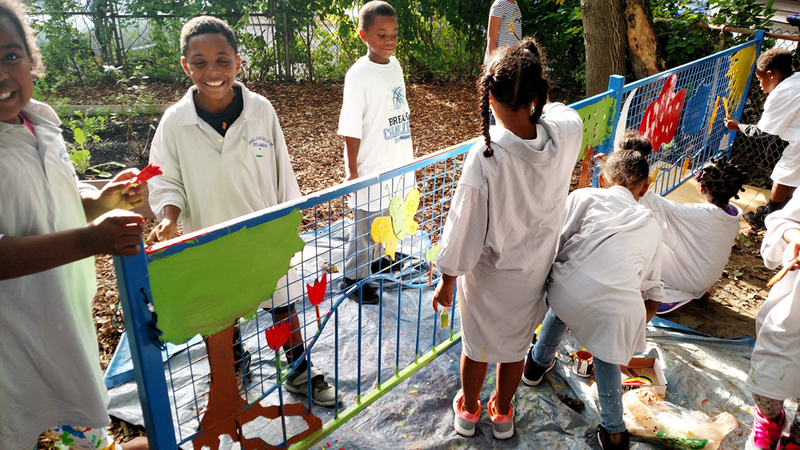 Students from Vincent Brown Rec Center paint the teaching garden fence. Photo courtesy Mount Hope Coalition to Increase Food Security. The coalition is sustaining success by continuing to support the team of trained community health workers, whose core skills and food systems knowledge are incorporated into ongoing programs. This success story was developed in partnership with Dannie Ritchie, founder of Community Health Innovations of Rhode Island​.